We have always done very well with the Scala Rider line of bluetooth headsets for bike-bike communications. Now there is a new option which we are very excited about. The new BlueAnt Interphone F4 is a bit of a game changer as it brings true stereo and AD2P into the fold. This headset has clamps or adhesive to work with virtually any helmet (full face, open face or half). It allows you to connect your GPS, phone, as well as a MP3 player and listen to them in full stereo. 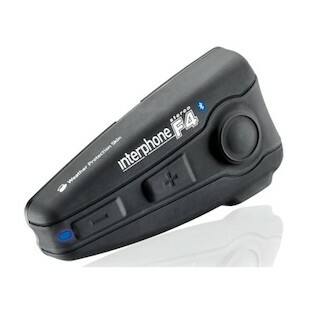 Additionally, each F4 unit can connect to up to two other F4 units for bike-bike intercom communications. The range is pretty considerable at 1640ft. The units are covered by a 2 year warranty from BlueAnt, and are 100% waterproof (up to a depth of 3ft). WebBikeWorld just did a great writeup on the unit, but if anyone has any specific questions not answered just give us a ring at 877-792-9455. These are in stock and shipping now.